The Hopper~ did you ever hear the story of the grasshopper who played his fiddle all summer while the ants prepared for winter? the hopper is 9" seated. the ant is 3". the mushroom is made from air drying clay. Red ball Jester~ approx. 14" seated. soft cloth body. 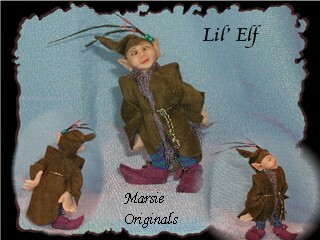 Little Elf~ approx. 5" seated. mushroom made from air drying clay. 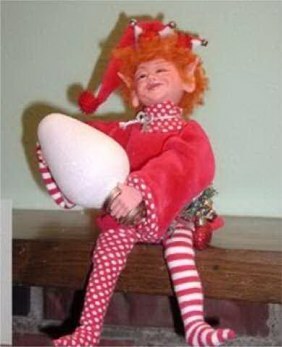 Christmas Elf~ this is the guy who steals your lights! 7" seated. made to sit on a shelf. He stands just a little over 3" tall. He is free standing, with tiny glass eyes.